The town of Kenner was the western (or upper) terminus of the Orleans-Kenner interurban line from 1915 until service was discontinued in 1930. During this time, the company also operated a "trolley park" along the line called Felix Park. It existed at the intersection of William Street (now Williams Boulevard) and 3rd Street (Jefferson Highway). Every summer, thousands of patrons took excursions along the O-K line to Kenner to picnic and dance to local jazz bands. Unfortunately, the relocation of the Mississippi River levee at Kenner in the early 1930s claimed much of the land formerly occupied by Felix Park. (This is also why there is longer a 1st or 2nd Street along the river in Kenner.) A small portion survives today as public land at the foot of Williams Boulevard providing access to the river. Another interesting aspect of the Kenner terminus is the turn-table which reportedly existed at this end, turning the interurban cars back around to make their return to New Orleans. 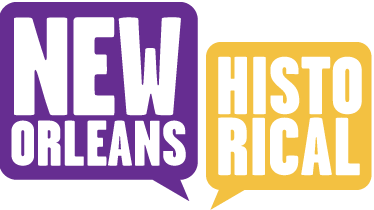 A series of improvements to Jefferson Highway during the mid- to late-1920s resulted in a paved road linking Kenner and New Orleans that contributed to a quick decline in patronage. Though the O-K Line was discontinued in 1930, its "Kenner Local" service remains in the nomenclature of the present bus service. O-K Line, Kenner depot, 1915: A rare view of an O-K Line car at the Kenner terminus soon after its opening in 1915. This car was borrowed from the New Orleans City Rail Road Co. as the O-K Line's dedicated cars would not be delivered until the following February. The O-K was later extended to the St. Charles Parish line in what was then known as Hanson City. 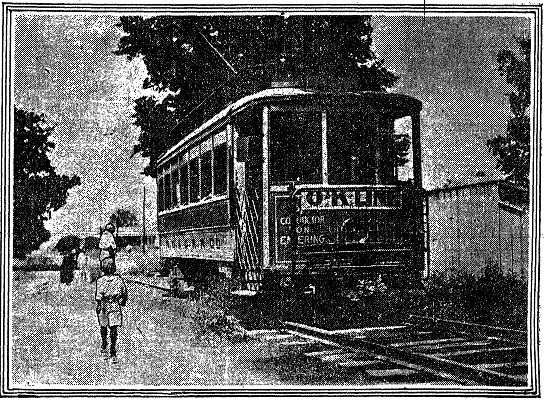 "Glimpses Along the 'O.-K. Interurban Trolley Line," The Times-Picayune, September 19, 1915. 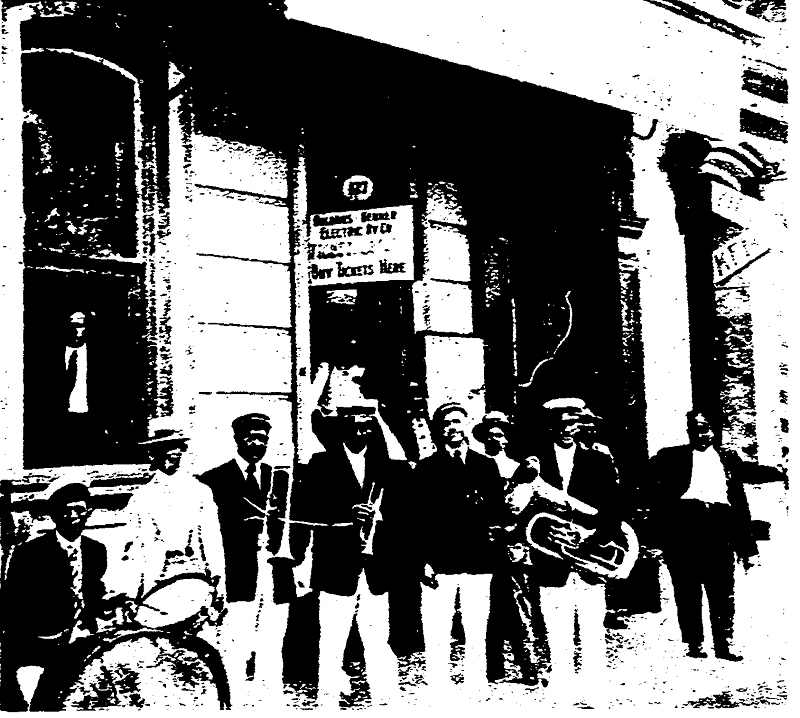 Felix Park jazz band, 1916: A jazz band performing at Felix Park poses outside the O-K Line headquarters and ticket office on South Rampart Street in downtown New Orleans in 1916. 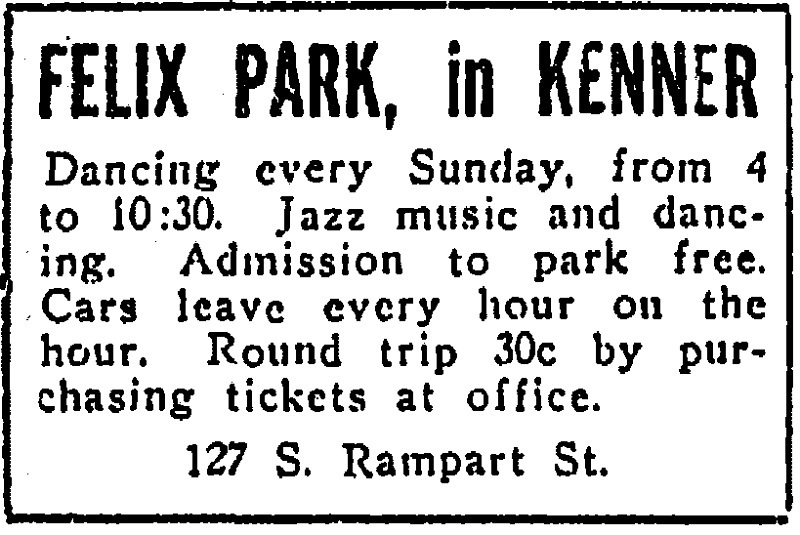 Felix Park contained a popular dance pavilion that hosted jazz bands similar to its larger and more well-known contemporaries, West End and Spanish Fort. The Times-Picayune, October 21, 1979. Felix Park ad, 1919: A typical newspaper advertisement for the O-K Line's service from Canal Street in New Orleans to the popular Felix Park in Kenner, a trip of about 14 miles each way. The Times-Picayune, April 26, 1919. 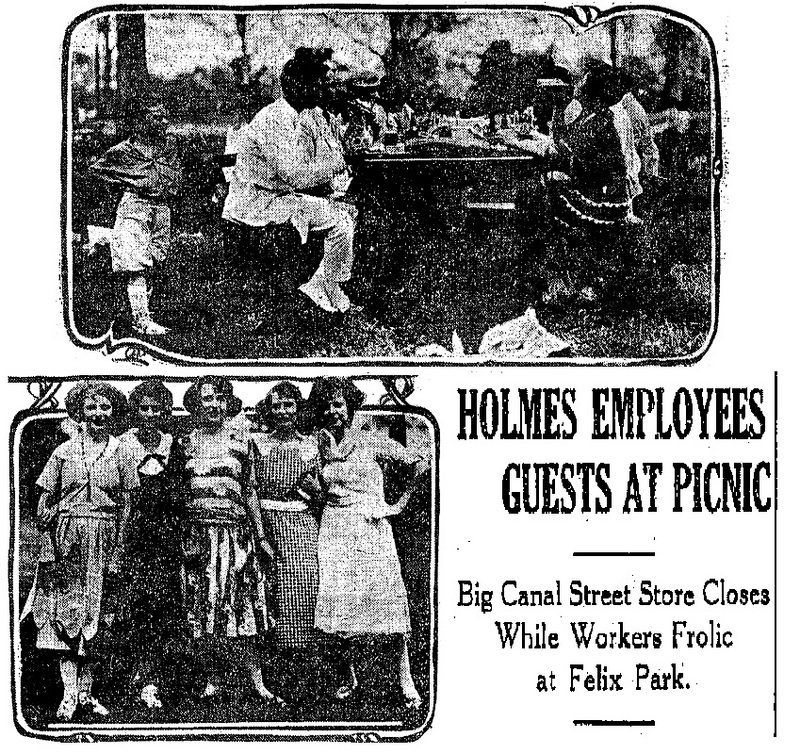 D.H. Holmes outing, Felix Park, 1921: The D. H. Holmes Department Store on Canal Street closed its doors on Saturday, August 27, 1921, while its one thousand employees enjoyed an outing at Felix Park. Outings and company picnics to Felix Park were popular during the O-K Line's heyday, and special trailers were often rented and pulled by the streetcar to transport patrons on these occasions. The Times-Picayune, August 29, 1921. Jeremy Deubler, “O-K Line: Kenner Depot & Felix Park,” New Orleans Historical, accessed April 24, 2019, https://neworleanshistorical.org/items/show/298.